A reminder, WitCH 2, WitCH 3 and WitCH 7 are also open for business. Our new WitCH comes courtesy of John the Merciless. Once again, it is from Cambridge’s text Specialist Mathematics VCE Units 3 & 4 (2019). The text provides a general definition and some instruction, followed by a number of examples, one of which we have included below. Have fun. With John the Impatient’s permission, I’ve removed John’s comments for now, to create a clean slate. It’s up for other readers to do the work here, and (the royal) we are prepared to wait (as is the continuing case for WitCh 2 and Witch 3). Part (f) is not present in the current online version of the text. It is also not present in the current student book PDF available from the same website. I will however confirm that the Specialist Mathematics Units 3&4 students I spoke with last year (and also at least one teacher of the subject) were unable to tell me whether or not the non-linear asymptotes required labelling on graphs. My follow-up question to said teacher was whether or not students would be penalised for leaving these “construction lines” in their graphs to produce sketches by addition of ordinates. The advice I was eventually given was to have students draw and label the non-linear asymptotes and hope for the best. Would definitely like to know (for genuine curiosity more than anything else) what the convention is here and (less importantly) what VCAA is and isn’t prepared to mark as correct. Thanks Number 8. Still curious about current hard copies. It is impossible to tell from the Study Design what is expected from students. Whatever is expected, the above excerpt from the text is a mess. 17f is in my hard copy (printed 2016). My hard copy is 2016 – admittedly old – and has part(f). It’s possible the digital platform my school uses only has digital copies of the older text. But I have had students from this year (2019) using pdf copies asking about part(f). Whatever, it’s a mess – incompetent meddling in things outside the scope of the course that leaves a trail of destruction for years to come. But as x approaches infinity, surely y also approaches infinity? The fact that y approaches sqrt(x) is true, but since sqrt(x) approaches infinity, isn’t this a bit redundant? I understand your point, but then why is a big deal made of the diagonal asymptotes of something like x^2 – y^2 = 1? 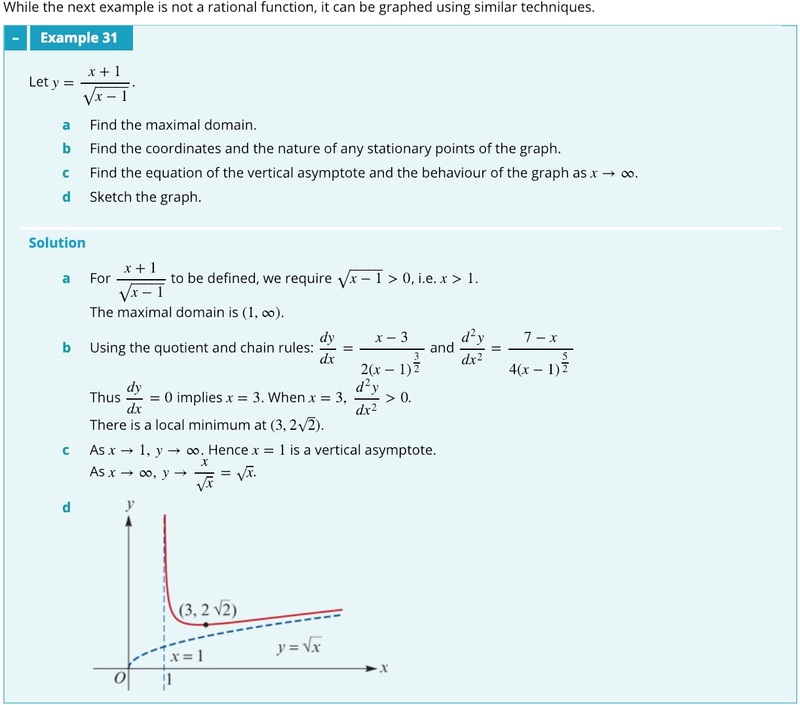 Because straight line asymptotes on graphs of non functions are a key feature of ALL graphs of this type? There also seems to be a (perhaps implicit) idea that asymptotes are straight lines – in that the graph of y=1/x has horizontal and vertical asymptotes and then a rotation by Pi/4 clockwise creates the two diagonal asymptotes. …but I really don’t know. I’d add that the general hyperbola (x-h)^2/a^- (y-k)^2/b^2 = 1 can be obtained from y = 1/x using not just rotations but also translations and dilations. So the argument could be made that the general diagonal asymptotes y – k = +/- b/a (x – h) emerge naturally via transformations from the vertical and horizontal asymptotes of y = 1/x and this validates them. But it would appear that a diagonal asymptote is also called an oblique asymptote …. So Thomas and Finney appear to define oblique asymptotes as linear asymptotes that are neither vertical or horizontal. So something like f(x) = x + 1/x would have an oblique asymptote y = x, whereas f(x) = x^2 + 1/x would have the dominant term x^2 for large |x| and the graph of y = x^2 would be included as a feature in a sketch graph of y = f(x) but not referred to as any sort of asymptote. and then says that y = f(x) is asymptotic to the parabola y = x^2 …. So Evans has opened a real can of worms, as has past questions on VCAA exams and the current Study Design …. Number 8, you are spot on with both remarks. Whatever the text is attempting to do in Example 31, to write y → √x is at best vague, and at worst meaningless. And, you are correct that there is a fundamental distinction one should make between linear and non-linear “asymptotes”. The text not only fails to make that distinction, it frames the discussion so that this distinction is almost impossible to make. I understand what Number 8 is saying and it makes a lot of sense (I too think you’re on the money). The crazy thing is that we’re all in the dark. The Study Design is singularly uninformative on this (as it is on many things) and as far as I know there has been no advice given in any VCAA Bulletin. In such cases one might look to past exams and Reports for additional insight. So it’s extremely interesting to note the 2000 Exam 1 Q1 Part 2 and subsequent comments in the Examiners Report (I don’t think the Study Design has changed all that much over 15 years with this part of the course), as well as the 2008 Exam 2 Q1. That, Sir John, is the right question to be asking, because it is (a) common enough a type of question and (b) rare enough (non existent) in official VCAA publications. I would assume even raising it at a “meet the examiners” session may prove pointless? I don’t get to go to these, so cannot offer to raise it. I will confess that teaching this part of the course prompts some anxiety in me. I can only imagine what it does to the students. I feel that it all stems from the study design, which offers very, very little in the way of direction. I am less anxious about rational functions, because I feel on (fairly) safe ground with assuming that both the numerator and denominator are polynomial functions. As curvilinear asymptotes have been marked in on previous exam questions (as noted by John) I feel fairly confident about telling students that they should include these on their graph along with the equation. However, at the bottom of the Functions and Graphs section of the Study Design sits the dot point: graphs of simple quotient functions. I do not feel that it is at all obvious what a ‘simple quotient function’ actually is, and the level of detail that students would be expected to include with these graphs. My anxiety is not helped by there being no mention of ‘quotient functions’ in any textbooks that I have looked at. I think that Example 31 is an attempt to address this dot point, although I can’t be sure. In any case, I now feel sick, so I am going to take whatever I can scrounge up in my drawer and go and lie down in the storage cupboard. Also, with Example 31, and going by how curvilinear asymptotes have been calculated earlier in the text, for this question should it not be y=sqrt(x-1)? Thanks very much, Damo. Your question is excellent and goes to the heart of this tricky WitCH: what, if anything, is wrong with the answer y = √(x-1) to 31(c)? Underlying your question, what precisely does one need to show to prove that a certain “line or curve” is a “non-vertical asymptote”? The second part of this equation goes towards 0 as x goes towards infinity, so the graph goes towards √(x-1). I feel that this is a more consistent extension of the approach taken with polynomial functions, as opposed to the logic that the textbook uses to give an asymptote of y=√x. But, well, really? It leaves me feeling deeply uneasy, and if students really can expect to get this type of question, then I don’t know where it stops, and I don’t know how to prepare them adequately to tackle such questions. In particular, Number 8 refers below to “quotient functions, or rational functions as some IB textbooks have taken to calling them”, but my question is: Are quotient functions the same thing as rational functions? Because in the Functions and Graphs section of the Study Design, one dot point refers specifically to graphs of rational functions (with mention of asymptotes and stationary points) and another dot point refers to “graphs of simple quotient functions” (the dot point in its entirety). I don’t know what they mean by that. I’m just going to have a quick lie down in my son’s pillow fort. It feels safe in there. That’s very good, Damo! I hadn’t thought of that: y = Sqrt[x-1] + 2/Sqrt[x-1] so y –> Sqrt[x-1] as x –> +oo. So there’s at least *two* ‘plausible’ non-linear asymptotes. What about re-writing as y = (Sqrt[x] + 1/Sqrtx])/Sqrt[1 – 1/x] and then taking x –> oo. What, if anything, is wrong with that (it also gives y = Sqrt[x]). Or expanding y = (x+1)/Sqrt[x-1] at infinity (ask WolframAlpha: y = Sqrt[x] + (x to a negative power terms)) and then taking the limit? And just to throw the cat among the pigeons, could y = Sqrt[x-a] where a e R+ represent plausible equations for the non-linear asymptote? An infinite number of non-linear asymptotes …?! Is the equation for the non-linear asymptote unique? (This question can only be answered after answering Marty’s question). And if it’s NOT unique, does it even make sense to talk about a non-linear asymptote? Under what circumstances *is* it unique? Does f(x) = x^2 + 1/x have a unique non-linear asymptote? An oblique (diagonal/slant) asymptote is a linear asymptote that is not parallel or vertical to the axes. A curvilinear asymptote is an asymptote that is not linear. Cambridge originally had a question 17: f(x) = (x^2 + x + 7)/Sqrt[2x+1] with a part (f) that asked for the equation of the “… other asymptote.” (the previous part asked for the vertical asymptote). This question appears to have been removed some time after 2016 …. • graphs of simple quotient functions. So I am assuming that VCAA intend for quotient functions to be different to rational functions (so they contain non-polynomial functions?). However, there is no elaboration on what these functions may look like, no direction to how detailed such graphs would need to be and no explicit reference to them in any textbooks I’ve seen. I’m assuming that it means that questions like Example 31 are fair game, but, well. Yeah. I am now going to crawl into my son’s pillow fort. It feels safe in there. Damo, I hear and share your anxiety with this part of the SM34 course. Quotient functions, or “rational functions” as some IB textbooks have taken to calling them bring with them all sorts of questions about what to label – not helped by a number of the issues you raise above. But the worst of them all (in my opinion anyway) is the example you mentioned of an examiners report where non linear asymptotes are labelled but there is no help from the report nor the study design about whether this is required. Students ask (rightfully so) about this every year and I am still at a loss about what examiners want to see. Which, unfortunately is the driving motivation here, not education. The author was trying, and failing, to impress. Whom, not who, but good points. I was just being snarky. There’s no question the authors try to impress on occasion, but here they’re just faking it. However, the fact that teachers don’t read this text doesn’t mean they’re not unduly “impressed” by it. Yes the text is unreadable for many teachers (and most students), but my sense is that teachers typically blame their own perceived shortcomings for this, rather than placing the blame where it belongs, with the authors. Apologies for the double up comments above, I think my posting today reflects my feelings about this topic. I don’t know what I’m doing. Damo, you appear to know MUCH more of what you’re doing than the authors of the textbook. You have given a perfect argument that the function y = (x+1)√(x-1) is asymptotic to the “curve” y = √(x-1). “Rational function” means a ratio of polynomials (analogous to “rational number”). The term “quotient function”, similar to “hybrid function”, doesn’t have any precise meaning. Still, one can get a sense of “simple quotient” as a ratio of polynomials, rooty guys and the like. Yes Marty, rational function means exactly what you say. But graphs of simple quotient functions could mean anything – from what I’ve seen in textbooks it has been interpreted as graphs of reciprocal quadratic functions, which is dumb because these are just rational functions of low degree …. I don’t disagree with your interpretation, but it’s not what immediately springs to my mind. My interpretation (that I use in the classroom) is that it means graphs of things like f(x) = 1/ln(x), f(x) = 1/(e^x -1), f(x) = 1/Sqrt[2x-1] etc. In other words, graphs of reciprocals of ‘familiar’ non-polynomial functions. I real problem would be if you’re right and therefore something like f(x) = (x^2 + 1)/Sqrt[x-1] is fair game. Because this function has all sorts of potential pitfalls when it comes to its asymptotic behaviour (however that is meant to be defined) …. I’d love to see what Cambridge thinks the equation of the curvilinear asymptote, if one exists, is …. What adds to the mayhem is that the Study Design specifically mentions graphs of the reciprocal circular functions, which I would have categorised within my above interpretation of simple quotient functions. It’s good that they get a specific mention, but it’s bad that you have to guess about the rest. What’s interesting is that asymptotic behaviour (whatever that’s specifically meant to mean) is only explicitly mentioned with the dot point on rational functions. But clearly this is intended to also apply to graphs of reciprocal circular functions. And of course an issue with my interpretation above is that it assumes quotient means reciprocal. simple quotient functions…”. Which seems to indicate that they consider quotient functions to be different (or broader in scope) to reciprocal (and rational) functions, except that they then only refer to reciprocal circular functions in the dot point. My concern is that the last dot point is so open that an examiner could conceivably put in a question like Ex31 and justify it by pointing to this dot point. Thanks, John and Damo. It is worth noting that “reciprocal function” also has no meaning that is not trivial: ignoring zeroes, every function is a reciprocal function. I almost have sympathy for the VCAA on this issue. But, I don’t. It is close to impossible and is definitely unworkable to state precisely what a curriculum will cover, what functions can be expected and what the student is expected to do with them. So, though “simple quotient function” and “reciprocal function” are not mathematical terms, there is some intuition for what the terms mean. If this intuition is then nailed down with clear examples, good communication and general good faith, then things are ok.
Alas, clear examples, good communication and general good faith are not VCAA’s strong suits. Returning to the work at hand, I also question finding the stationary point before considering the asymptotic behaviour. If you do this the other way around, then it is obvious that the stationary point has to be a minimum and alleviates the need to find the second derivative. The key is to have a definition of either “behaviour as x –> oo” or “curvilinear” asymptote. y = g(x) is a horizontal, oblique or curvilinear asymptote of the function y = f(x) if lim[f(x) – g(x), |x| –> oo] = 0, where g(x) neq f(x). This defines a unique horizontal, oblique or curvilinear asymptote for all rational functions. But not for things like Cambridge’s y = (x+1)/Sqrt[x-1] where all functions of the form y = Sqrt[x-a], a e R+, satisfy the condition, implying an infinite number of asymptotes to be labelled on any graph that’s drawn. And for a function like y = (x^2 + 1)/Sqrt[x – 1], although it would be natural to think like Cambridge and claim h(x) = x^(3/2) as a curvilinear asymptote, this is not the case. It fails the above definition. However, a function that *does* satisfy the above definition is h(x) = x^(3/2) + Sqrt[x]/2 (another one is h(x) = (x + 1)Sqrt[x-1]). But how you get h(x) = x^(3/2) + Sqrt[x]/2 is not within the scope of the course, nor is long division of a radical into a polynomial …. So a tighter definition is needed if the curvilinear asymptote is to be unique in general, and I haven’t come across one. I suppose you could arbitrarily decide that it had to be a power series containing positive powers (not necessarily integer) of x (so that it corresponded to the leading terms in the expansion at infinity) …. I note that Sqrt[x] is always the leading term in such a power series for Sqrt[x – a] …. But this is all way past Yr 12. I have no problem with the dot point “simple quotient functions”, *provided* identification of non-linear asymptotes is not required for non-rational functions. But the Study Design does not say one way or the other. I’d love to see it on the exam, purely for the huge sh*t storm it would generate. It appears the the curriculum documents have never been clear on exactly what functions and features are required. In the past, rational functions of the type f(x) = ax^m + bx^-n + c (m,n = 1,2) have been explicitly stated but nothing said about asymptotes. Even the old VCAB Mathematics A and B Handbook (a much better curriculum document than all the Study Designs, containing substance rather than waffle) says nothing. And going further back to VUSEB the rational functions were all of the type where the degree of the numerator was never greater than the degree of the denominator by more than 1 (so that asymptotes were always linear). In summary, it is my opinion that in Specialist Maths Units 3&4 you can reasonably ask for linear asymptotes (vertical, horizontal, diagonol/slant/oblique) of any function but you can only ask for non-linear asymptotes when the function is rational. It would be nice if the Study design made such clarification, with examples, as well as gave a glossary of notation, definitions and terms (which the old VCAB Handbook did). John, I don’t think the definition of asymptote you quote/semiquote is natural, and I don’t think it gives a unique asymptote for rational functions. Well, that’s a revolting development because in that case I don’t see the way forward through this mess. Do you (or anyone else) have a counter example of a rational function where the definition does *not* give a unique horizontal, diagonal/slant/oblique or curvilinear asymptote? John, maybe I misunderstood what you wrote or intended to write. As concrete examples, what is the asymptote(s) to each of the following functions: 1) y = x + 1/x, 2) y = x, 3) y = 2 + 1/x, 4) y = 2? The answer can be either according to a) the Cambridge definition, b) your definition, c) what we would *like* the answer to be. So, twelve questions in all. 1) VA x = 0, OA y = x. 2) No asymptotes. (NB f(x) neq g(x) in the definition I’ve written). 3) VA x = 0, HA y = 2. 4) No asymptotes. (NB f(x) neq g(x) in the definition I’ve written). I should say that I haven’t used the definition to *find* the equations of the oblique and horizontal asymptotes, I’ve considered what happens when |x| –> oo (like Cambridge does). But what I did do is use the definition to *confirm* the equations were ‘correct’ (well, correct under the definition). A bit like *finding* the limit of x^2 as x –> w, say, by substituting x = 2, getting 4 and then *confirming* the limit is 4 using the epsilon-delta criterion (the confirming part doesn’t happen in Yr 12). Which is what’s needed with an example like (x^2 + 1)/Sqrt[x-1] to *confirm* that something like h(x) = Sqrt[x] is actually *wrong*. John, sticking to 1), is y = x + 1/x + 1/x^2 an asymptote to y = x + 1/x, in the sense of a) and/or b) and/or c)? Because why stop with y = x + 1/x + 1/x^2 being an asymptote to y = x + 1/x …. Let’s have y = x + a/x + b/x^2 where a,b e R+. And let’s add y = x + a/x + b/x^2 + c/x^3 etc. So the assumption that asymptotes have non-negative powers needs to be an explicit requirement. I guess I’ve always assumed this because I’ve never see y = x + 1/x in *any* textbook having asymptotes additional to x = 0 and y = x …. Yep, that’s the point. The Cambridge definition leads to “anarchy”. So, how does one avoid anarchy? Cambridge’s ‘definition’ is more a technique: Let x –> oo and see what function y approaches. The technique works for rational functions (just like finding the value of some limits is OK by substituting the value in) but will fail in general for non-rational quotient functions eg. (x^2 + 1)/Sqrt[x – 1] if not done carefully. y = g(x) is a horizontal, oblique or curvilinear asymptote of the function y = f(x) if lim[f(x) – g(x), |x| –> oo] = 0, where g(x) neq f(x) and g(x) has no negative powers of x. This definition also deals with all the curvilinear asymptotes h(x) = Sqrt[x – a], a e R+, of (x+1)/Sqrt[x-1]: Take the series at infinity, let x –> oo, and keep the sqrt[x] term. So it’s not complicated for rational functions (it’s just like calculating limits by substituting the value of x) but is potentially tricky for non-rational quotient functions. Cambridge gives both a technique and a general definition. As John notes, the technique is best thought as applying to rational functions, but even in this context the technique conflicts with the general definition. I think the Cambridge definition can be tightened in the manner John suggests, but it’s probably easier to directly state the type of function permitted to be an asymptote, rather than the piece-by-piece ruling out of undesired behaviour. Well, I would propose that the type of function permitted to be a curvilinear asymptote is a sum (either finite or infinite) of powers of x where all powers of x are non-negative (and not necessarily integers). Marty, what definition of function would you propose? John, I don’t think there’s one correct answer. It depends upon which functions you want to have asymptotes, and whether you want the asymptotes to be unique. The question is fundamentally tricky. A blithe approach, as in the excerpt above, is asking for trouble. So we can just say we want polynomial non-linear asymptotes for rational functions. That works fine, particularly at the VCE level. And we can all agree that hyperbolas have straight line asymptotes (vertical and horizontal, or diagonal/slant/oblique). But it gets trickier for non-rational functions eg. the hyperbolic functions sinh and cosh. I do want them to have unique curvilinear asymptotes, or at least to be able to talk about how they behave as |x| –> oo. Do we simply say that things like y = (x+1)/Sqrt[x-1] or (x^2 + 1)/Sqrt[x-1] has no non-linear asymptotes? Ruling out functions would seem to be no better (or worse) than ruling out undesired behaviour …? It boils down to definitions – but I haven’t seen definitive definitions anywhere that address the issues in this wiTCH (certainly none that you could easily present at the VCE level). In fact, this wiTCH is the possibly the only place where these issues have actually been raised, discussed and some attempt made at a resolution …? So, what’s our criteria? If there’s no unique curvilinear asymptote in the sense of lim[f(x) – g(x), |x| –> oo] = 0 then do we simply say that there’s no non-linear asymptote …? Yes, to all of that. It is natural enough to restrict oneself to polynomial asymptotes. Or, more generally and as you suggested earlier, sums of powers of x. But then plenty of functions will not have asymptotes. Such is mathematical life. I’m not sure that I have anything new to add here, but this post has been rattling around my head a bit and I thought I’d get my thoughts down. Specifically, there has been a lot of discussion on here about what an asymptote is, but it really got me thinking, why are asymptotes important? What was the motivation around finding and defining asymptotes? And I realised that I don’t know the answer to that, that I have never really thought about it. However, I suspect that it was primarily to aid graphing (and to give us an understanding of how an unfamiliar function behaves through comparison to a familiar function). In which case, as soon as a curvilinear asymptote becomes overly difficult to sketch, it has lost its usefulness and, well, what’s the point. I think that this is central to the above discussion between John and Marty, but for my own benefit I thought that I’d make it explicit, and be corrected if my thinking is wrong. If I am right with this, however, then are we even being too open by restricting asymptotes to polynomials or sums of powers of x? Certainly, some of these asymptotes could be tricky enough to sketch on their own that we could reasonably ask, what’s the point? While on the other hand, an asymptote of y=sqrt(x) could be entirely reasonable. At this level, I would think that it would make sense for the study design to be very explicit about what asymptotes students could be expected to sketch, and, if they do want students to sketch curvilinear asymptotes, I don’t see any reason why they need to go beyond quadratic asymptotes. Damo, all excellent thoughts. You are correct, the idea of “asymptote” is to give a simple guide to the behaviour of a function at infinity. And yes, the more elaborate we permit “asymptote” to be, the less use it is. It’s like Lewis Carrol’s map with a 1:1 scale; if the model is too specific you may as well just use the real thing as the model. (x3 + 4x2)/(x + 9) . What is the “asymptote” by John’s suggested multi-power definition? How do we find it? What is the “asymptote” by Damo’s suggested single-power definition? How do we find it? Which definition is “better”? As to what this means for sorting out the VCE curriculum, I don’t know and I don’t much care. My hobby is pointing out crap, and pointing out that the educational authorities and the textbook writers are either unaware or don’t give a stuff that it’s crap. Or, of course, both. But, until some powers that be indicate that they are aware of the school crap and are concerned to fix it, discussing how one might fix it seems to me an exercise in futility. To start with, I would say that the asymptote of (x^3 + 4x^2)/(x + 9) would be y=x^2 – 5x +45. However, I would query the usefulness of this asymptote, at least when it comes to sketching the function. What do we know about the graph of this function? – We can easily ascertain the behaviour of the function as x-> -9. – Using the first derivative, we can see that (0,0) is also a TP. Less easily, we can find the other two turning points. – Finally, we know that as x -> +/-inf, the graph goes towards +inf. With this information, we can get a pretty good sketch of the function. So how important is it to sketch the asymptote? How important is accuracy when sketching it? How much does it actually add to our understanding of the function? Is this a reasonable question for Year 12 students? This last question is, I think, the key. Because, this topic does prove stressful for Year 12 students. Also,I don’t know the answers to the other questions that I have raised above, but I would like to be able to give as much clarity to my students as possible. And while the initial post identified some crap in a textbook, I think that it does raise some important questions for VCAA. Not that I would hold my breath, waiting for an answer. Finally, an interesting (to me) aside. The question in the original post actually first appeared in Galbraith and Fitzpatrick’s Pure Mathematics (mostly as presented here). So, this has been rattling around Victoria for a while, and Evans might not have to bear full responsibility for this particular can of worms. Although it does raise another question – Is this plagiarism? And fairly mindless plagiarising at that? How important is it to sketch the asymptote? How much does it actually add to our understanding of the function? Yes, it’s good to wonder how reasonable a question this is for Year 12 students. But what about 1st year maths students? 2nd year …? Yes, it’d be great to get clarification from VCAA on what asymptotes *they* expect, as well as clarification on what’s meant by reciprocal functions as opposed to quotient functions. But you’re right about the breath …. You could argue that nothing beyond linear (vertical, horizontal, diagonal) asymptotes are needed. And I think you could well argue that only vertical and horizontal asymptotes are really needed when it comes to drawing graphs …. Now, if anyone can point to a reference that gives a definitive definition or formalises the issues raised in this wiTCH, I’d love to know! p150 Eg. 9*: Sketch the graph of the function defined by f(x) = (x+1)/Sqrtx-1]. (The * means “May be omitted”, I assume because it wasn’t part of the course). It then continues with finding the turning point and then shows the graph. It would be interesting to know what the Study Design equivalent of the time has to say about asymptotes, although I suspect it’s very little if the subsequent VCAB syllabus is anything to go by (which by the way is infinitely better than the current Study Design) …. Anyway, the other leading Year 12 textbook of the time was Lucas and James ‘Sixth Form Pure Math’ (Lloyd O’Neil publisher), which has little to add this discussion and did not (perhaps wisely so) go near examples like this. Damo (and John), thanks again. I didn’t mean to deny the worth of clarifying the nature and extent of this topic for VCE students and their beleaguered teachers. But, coming to a sense on this blog of how the topic could or should be framed gives essentially no insight into VCAA thought (or lack thereof). It’s the latter that is of practical importance, and I see no way of gaining that insight without the use of a cattle prod. What I do like to do is to try to tease out the real mathematical ideas and issues and questions and worth. Whether and how that all fits in with VCE is secondary (for me). To that extent, I think you’re approaching the questions in a perfectly understandable but somewhat constrained, VCE-ish manner. So, you ask how much the “asymptote” helps with graphing, but the underlying question is, what is the behaviour of the function? It is the algebraic/analytic characterisation of this behaviour that is powerful, not the picture.